The Smith & Wesson J-frame .38 Special has been around for over fifty years now in its original "Chief’s Special" configuration. 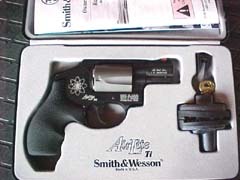 Since then, S&W has added many variations of the original, but the J-frame line of thirty-eights is still the standard to which all other small frame revolvers are compared. We recently received at Gunblast.com for testing one of Smith’s latest renditions of their venerable pocket thirty-eight; the model 342PD Centennial. The Centennial revolvers have a true concealed hammer design, allowing double-action-only fire. For a self defense gun of this size, the double-action-only system works just fine. As with any self defense handgun, it is meant to be carried comfortably concealed, and hopefully never used against an attacker. In the event that it is necessary to use the gun in defense of one’s life, the double-action-only system of fire works very well indeed. There are three major advantages to the Centennial concealed hammer design. First, this design results in a revolver that is as snag-proof as a pocket revolver can be. There is no hammer spur protruding from the top of the gun to hook itself into clothing while drawing the weapon from pocket or holster. Second, the frame and side plate are raised in profile at the back just above the grip to conceal the hammer, resulting in a hump that is very beneficial in controlling the weapon during recoil. It prevents the gun from rocking upward in the hand under the recoil of heavy +P loads, allowing a faster rate of fire and eliminating hammer bite. Third, the Centennial design prevents lint, dirt, and other crud from getting into the inner workings of the gun around the hammer. In a pocket revolver, this latter feature is very important. A gun carried for self defense has to work when needed, every time. 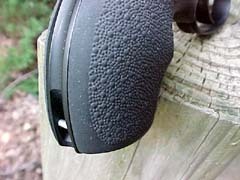 If the action is full of debris, the function can be greatly impaired. Drawing a weapon that doesn’t work could be very embarrassing at best, and even detrimental to one’s health and well-being. These three features of the Centennial design make it, in my opinion, the best of the J-frame thirty-eights. The S&W 342PD is the lightest of the Centennial series, weighing a feathery 10.8 ounces. Smith & Wesson has pioneered the use of titanium alloys in its revolvers, resulting in weapons that are much easier to carry concealed, without sacrificing strength. Titanium, when compared to steel, is lighter, tougher, and absolutely rust-proof. The 342PD is over four ounces lighter than the aluminum-frame/steel cylinder 442, and three-quarters of a pound lighter than the stainless steel model 640. 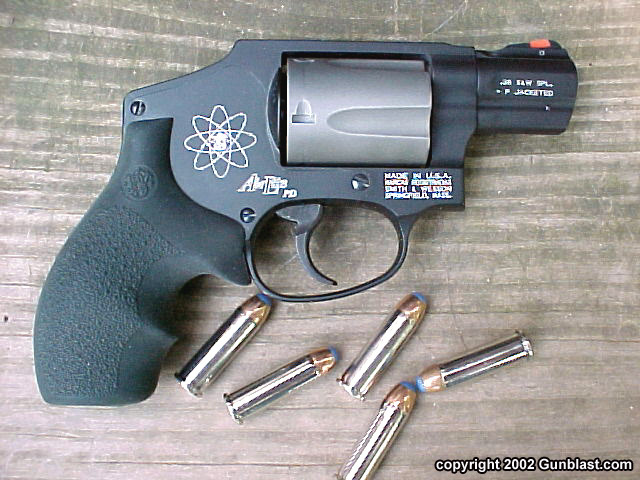 In a pocket gun, every ounce counts, and the 342PD is the lightest concealed-hammer .38 Special revolver you can buy. Only the S&W 337PD exposed-hammer Chief’s Special is lighter, by one-tenth of an ounce. The 342PD has a handsome two-tone finish, with the aluminum frame, barrel shroud, and cylinder yoke finished in a matte black, and the titanium cylinder and stainless barrel liner in a dull gray. The barrel / cylinder gap on this revolver is very even and tight for a revolver of this type, measuring only three one-thousandths of an inch. The 342PD has a fixed notch rear sight with a highly visible red insert in the ramp front. These sights are just about perfect for a snub-nose revolver, and are absolutely snag proof. 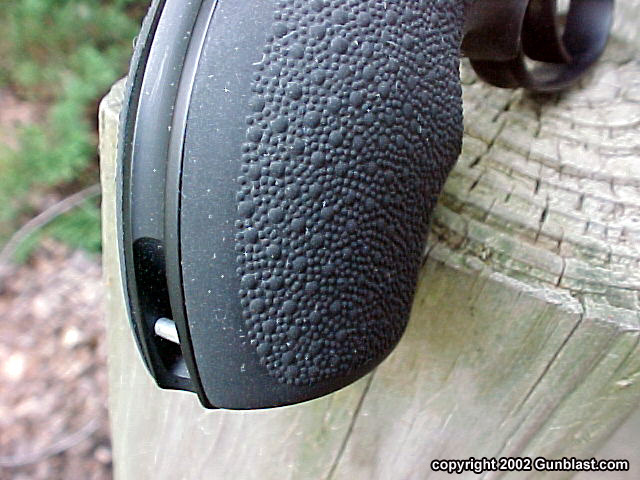 The trigger is five-sixteenths of an inch wide and smoothly finished on its surface, resulting in a trigger pull that feels lighter than the ten and one-half pound measured pull weight. The feel of the action, in typical Smith & Wesson style, is buttery smooth. The trigger is within easy reach of even a small hand, but the excellent Hogue Bantam synthetic grip feels great in my large sized, fat-fingered left hand. The ejector rod on the 342PD is protected by the barrel shroud, and provides a five-eighths of an inch ejection stroke. The top of the frame, bottom of the trigger guard, and back strap of the grip frame have been relieved of excess metal for further weight savings. The 342PD has Smith & Wesson’s internal locking system. This key-activated system blocks the movement of the hammer and trigger, but the cylinder can still be opened for loading and unloading of the gun. The S&W locking system is unobtrusive and easy to use, requiring only that the key be inserted above the cylinder release and turned counterclockwise to lock, and clockwise to unlock. While I think that no safety device can substitute for proper training, this feature could be useful in the event that the gun, when stored, could possibly find its way into untrained hands. The 342PD came supplied with two keys for the internal locking system, a trigger lock with two keys, and a locking hard case. Testing of the 342PD consisted of firing as many different types of .38 Special ammo as I could find; from cast bullet hand loads, to factory +P hollow points, and high performance specialty ammunition. All ammo tested worked perfectly in the little Smith, with no failures of any kind. 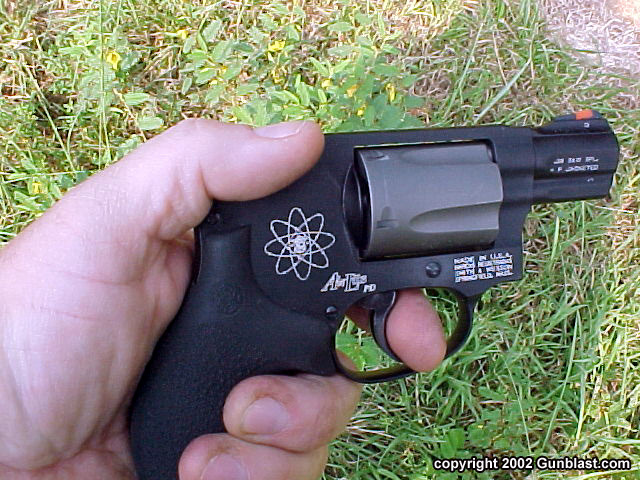 Accuracy of the 342PD was very good for a lightweight revolver with a one and seven-eighths inch barrel. While a snub nosed revolver can be as intrinsically accurate as a long barreled one, the combination of light weight and a short sight radius make the snub nose harder to hit with for most shooters. All ammo tested grouped under three inches at twenty-five yards, which is decent combat accuracy. I also tried the little five-shooter against some steel javelina silhouette targets at a range of forty yards, with surprisingly satisfying results. I was able to ring the steel more often than not, with the +P ammo toppling the little pigs with ease. In the lightweight 342PD the recoil is noticeable, but due to the grip shape and the excellent Hogue Bantams, the gun is quite manageable. I was very impressed by one type of specialty high performance ammo in particular: that being the Glaser Safety Slug. The Glaser has been around since the mid-1970s, and has benefited from several improvements since that time. The Glaser has a pre-fragmented core of compressed number twelve shot (a core of number six shot is also available), capped by a soft plastic ball, inside a bullet jacket. The Glaser Safety Slug tested uses an eighty grain bullet rated at +P velocity and pressure, and chronographed at an average of 1268 feet-per-second from the short one and seven-eighths inch barrel of the Smith. The idea behind the Glaser is a slug that will dump all of its energy quickly into the target, without excessive penetration of the target. As can be seen in the photos, the terminal results on a large ripe watermelon were very impressive. 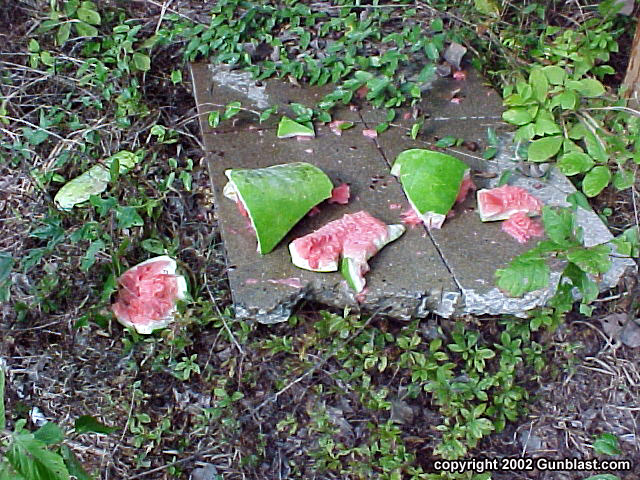 While a watermelon bears little resemblance to flesh and bone, it does demonstrate the relative effects of a high velocity projectile which dumps all of its energy into the target. The interior of the watermelon was pulverized as if hit by a high velocity rifle bullet, with pieces and pulp scattered over an area of about eighteen feet. The performance of the Glaser has been proven in ballistic gelatin and on human flesh, and I think that it is the cartridge of choice in a small .38 revolver. In the +P rated 342PD, the Glaser shot to point-of-aim, with very good accuracy. The round offers high velocity, good accuracy, and a low chance of penetrating the target and hurting someone else, along with exceptional terminal performance. While the Glaser Safety Slug is not cheap, how much is your life worth? For a couple of months I have been carrying the 342PD around, usually in my front left-hand jeans pocket. It rides there very comfortably in an Uncle Mike’s pocket holster, or sometimes dropped into the pocket without the holster. 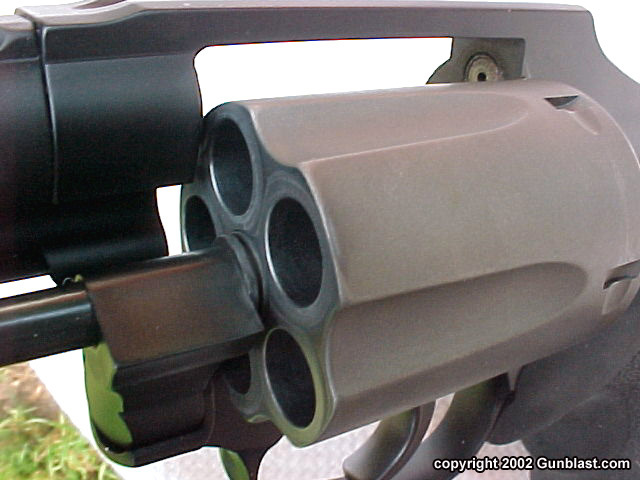 Due to the five shot cylinder, the gun is relatively thin and doesn’t print at all, as can be seen in the accompanying photo. In the picture, the gun is in my left-hand pocket within easy reach of my hand; loaded and ready, but out of the way. 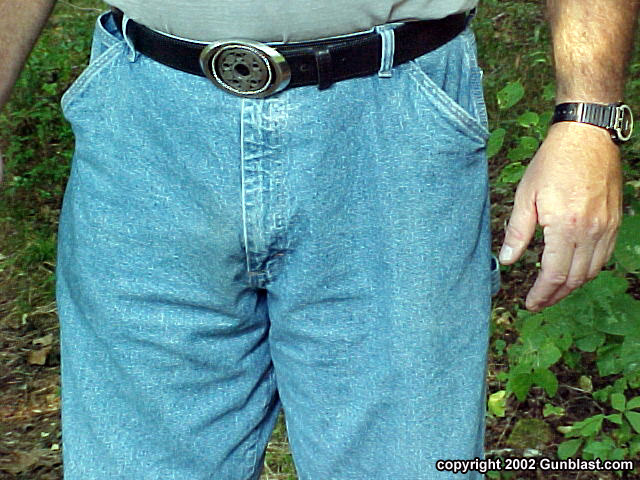 This is the best way to carry a gun while wearing jeans and a tucked-in tee shirt. While wearing a coat or light jacket, the 342PD rides unnoticeably in a front side pocket. A person can place his hand on the gun without drawing unwanted attention, yet be able to fire immediately if necessary, even through the pocket without the gun jamming, as could an autoloader or exposed-hammer revolver. The lightweight J-frame is a good compromise between portability and power, and the 342PD is the best of the J-frames to carry for self defense. Carried with a payload of five Glasers, you have a dependable, powerful, and lightweight package that can always be with you, instead of a larger weapon that may be left at home. Remember, the first rule of winning a gunfight is to have a gun. The 342PD is a gun that can be at hand when needed, yet powerful enough to get the job done. 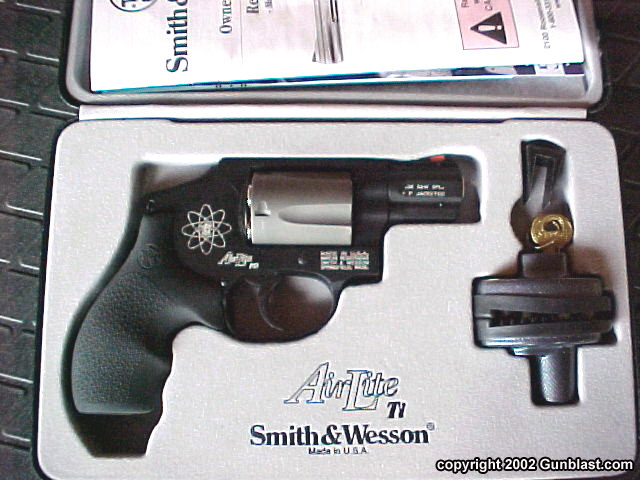 Check out the full line of Smith & Wesson products online at: www.smith-wesson.com. 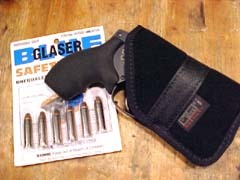 For more information on the Glaser ammunition, go to www.safetyslug.com. Smith & Wesson's J-Frame Model 342PD comes with a fitted, lockable case, trigger lock, and two keys for S&W's internal locking system. Author demonstrates the handy size of the S&W Model 342PD. Titanium 5-shot cylinder of the S&W Model 342PD. 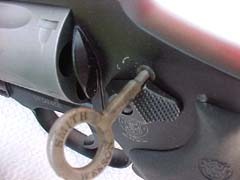 S&W's internal key-locking system blocks hammer & trigger movement but allows cylinder to be opened. 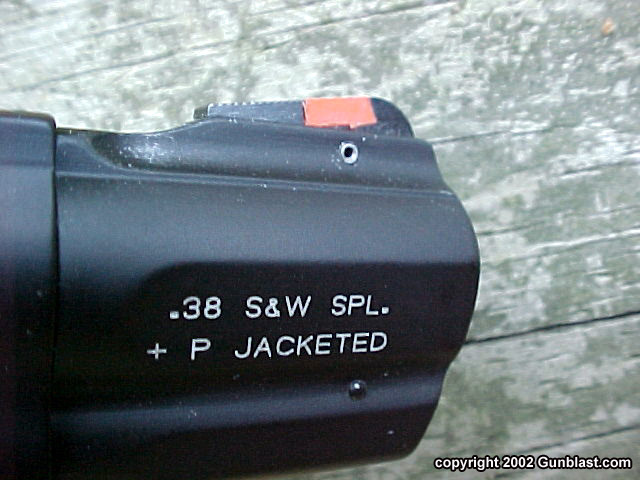 The Model 342PD features a very effective red ramp front sight, along with a fixed rear notch. These sights can be improved upon with an aftermarket "night sight" such as XS Sight Systems' "Big Dot" Tritium Night Sight. The S&W Model 342PD sports Hogue's excellent Bantam grips and a lanyard pin. Carried in an Uncle Mike's pocket holster and stoked with the great Glaser Safety Slugs, the Model 342PD is a potent pocketful of power. 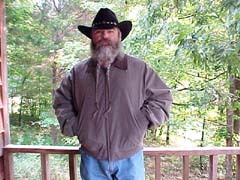 The S&W Model 342PD rides unnoticed in Jeff's left-hand front pants pocket, within easy reach of the Southpaw Scribe. 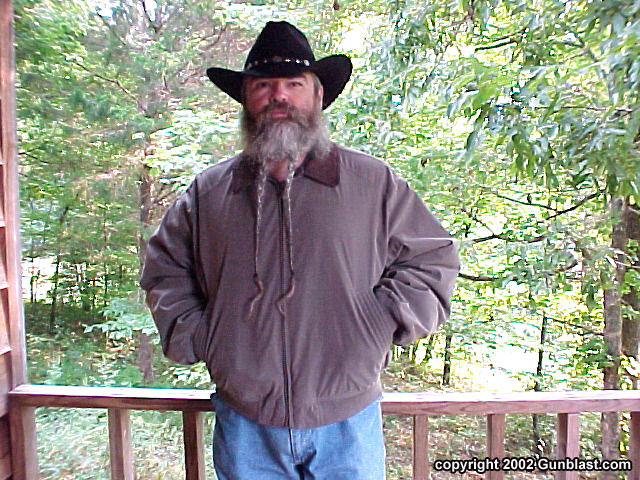 Author, with his hand on the Model 342PD in his left jacket pocket, is ready for casual or deadly human interaction. The S&W Model 342PD, shown with a cylinder full of Glaser Safety Slugs. Author found the excellent Glasers shoot perfectly to point of aim in his Model 342PD. 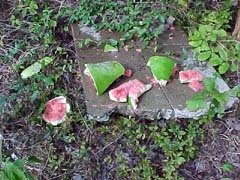 The destructive power of the Glaser +P load is shown on a ripe melon from Jeff's garden.